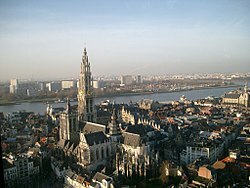 ^ Antwerp Tourist Information - Meredith Booney, "The name 'Antwerp' has been linked to the word "aanwerp" (alluvial mound), which was the geographical feature in the early settlement period in this place". ^ Dunton, Larkin (1896). The World and Its People. Silver, Burdett. p. 164.